Will the cult of Swazi King Mswati ever end? Mswati III of Swaziland is accustomed to marking his birthday with a no-expense-spared celebration, literally one fit for a king. But with his country's economy in free fall, this year there is no budget for a lavish do on Thursday 19 April as he turns 44. Home Affairs Minister Prince Gcokoma has called on ordinary Swazis to donate cows to be slaughtered for a mass feast where there will be traditional music and dancing. But this call - in a country where more than 60% of the population live in poverty and where one in four is HIV-positive - has sparked outrage. Rated by Forbes magazine as one of the world's richest monarchs with an alleged personal fortune of more than $100m (£62.5m), King Mswati has 13 wives, each with her own palace, security entourage and fleet of luxury cars. Yet his kingdom is facing financial ruin linked to the global economic downturn with a drop in revenues from a regional customs union. Late last year, it needed an emergency loan of several million dollars to cover its salary bill which the International Monetary Fund says is not sustainable, advising that 7,000 civil servant jobs need to be urgently cut. The threat to jobs has been a trigger for labour protests which have evolved into pro-democracy calls. These campaigners see the king as a "deluded multimillionaire" and want an end to his absolute rule and the unbanning of political parties. International media outlets miss no opportunity to pour scorn on the portly British-boarding-school educated king, who often attends official events bare-chested in traditional robes. But Sam Mkhombe, private secretary to the king from 2004 until 2011, says the foreign media's portrayal is unfair and "fed by his detractors". He remains fiercely loyal despite being fired from office for his alleged involvement in trying to promote political parties. 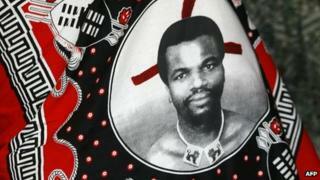 "The king is very important to the Swazi nation because he is their symbol of unity and their identity," he told the BBC. "The people love their king and they believe that he was given to them by almighty God." Mr Mkhombe also maintains that the king's leadership style and eloquence is also admired. Fellow former royal adviser Mandla Hlatshwayo, now active in the country's pro-democracy movement, agrees that the monarchy as an institution is held in very high esteem. "Swazis normally refer to the king as the sun that shines on the land or the mouth that tells no lie," he says. "The deeper meaning of this is that the king is not just a king for himself or his family or those who agree with him but a king for all the people of Swaziland regardless of their political or religious persuasion, including those who disagree with him." Ordinary Swazis tend to refer to the king in hushed tones and always with respect - and do not like to be questioned about him. The bold criticism of the monarchy from sections of the pro-democracy movement is seen as one reason why they have failed to inspire mass support during their protests. However Mr Hlatshwayo, now a businessman living in exile in South Africa, says people are starting to lose faith in the king. He believes King Mswati has failed to live up to the legacy of his late father, Sobhuza II, who opted for an absolute monarchy and banned political parties in 1973 and remains greatly respected. "Sobhuza during his later years used to openly defend the rights of citizens to disagree with him and often stated that he was merely a trustee of the Swazi nation. "But Mswati is not seeking to find a compromise with his people but is imposing his will by military force." Swazi magazine editor Bheki Makhubu, who has spent time in prison for his outspoken views, believes the king has lost touch with his subjects, with one "terrible weakness at the heart of the problem". "He likes the finer things in life. Now, this works for his advisers. It is what has fostered corruption," he says. The extent of the king's power has also corrupted him, he says. "He operates from the premise believing that he can do no wrong, as we Swazis have been telling him for the last 25 years. "Why shouldn't he believe that if this is what we have been preaching to him since he was an 18 year old?" But while many people grumble about the king, few would consider trying to overthrow him, Mr Makhubu says. "We are like an abused wife who believes she is the one who causes the problems that prompt the man to beat her up." Four years ago, Swaziland staged the so-called "40/40" celebration marking King Mswati's 40th birthday and 40 years of independence - a shindig that cost in excess of $2.5m and drew staunch criticism, particularly from aid donors. This year's event, due to be held at the King Sobhuza II Memorial Stadium in Nhlangano in the Shiselweni region, will be on a much smaller scale. However, banned opposition party the People's United Democratic Movement (Pudemo) says it should be cancelled with the money already collected donated to good causes. And the newly formed Trade Union Congress of Swaziland has urged its members to stage an anti-strike and go to work on Friday - a public holiday to mark the birthday. The Swaziland Democracy Campaign pledged a birthday gift of mass mobilisation and widespread street protests last week, though this proved a damp squib given a heavy police presence and court action by the government. However, Mr Mkhombe, who now works as a private business consultant, defended the celebration which he said was an important part of "nation building". "Nation building has its costs in any state." He predicts that the thousands who will turn up at the stadium will do so for the love of the king and not for the free food, as some have suggested. But for Mr Hlatshwayo, the days of Swazis worshipping their king as a divine leader are numbered and it is only a matter of time before he has to give up his absolute power and allow democratic rule. "The king has a limited window to provide constructive leadership and open dialogue with his people about political reform. He has no other option. Change will happen."